The Arcadia project was a personal challenge. I tried to use all techniques that I have learned over the last few months by myself. By the way I’m interested in the history of art and I always try to learn as much as I can from the great masters of the last centuries (Caravaggio, Possin, Casper David Friedrich and so on) Maybe from there comes the slight 2D/painting touch in the final image? It’s crazy that they were able to create such amazing artwork without any dual processor, 4GB RAM workstation and two 24 inch displays 🙂 My first inspiration was like a brainwave. I saw a picture of some old columns and five minutes later I had my first poor sketches on a piece of paper; as you know, it’s important that you draw down all the good ideas that comes into your mind, no matter how good you can draw! After intense sketching, I came up with a desert columned hall, a crashed airplane and a divine light in the background. I subdivided the whole scene in a foreground that shows decaying wreckage (here I put the airplane and the jet); the space in the middle of the picture represents a hopeful presence (this is where you can see the two travellers); and finally an uncertain future – the shining background. But enough now with these scary explanations and the art stuff 🙂 Let’s have a look at the technical part. In this tutorial I will not go into step by step details and I assume that you are familiar with the basics of 3ds Max, VRay and Photoshop. All right, let’s get started with one of the trickiest part of the whole process. Not everything that works on paper, works in 3D space, too. 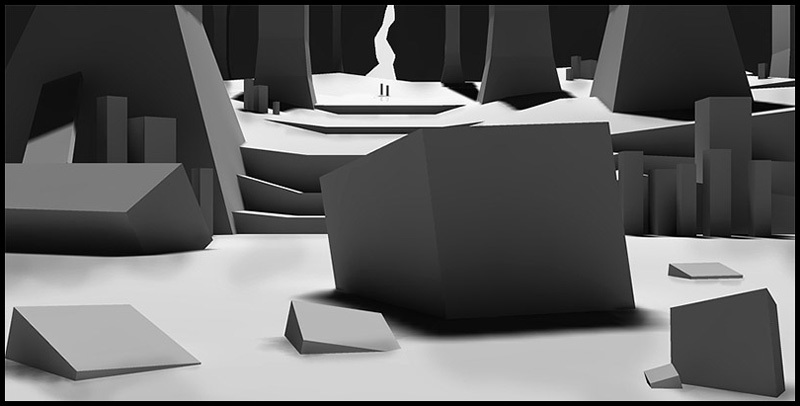 So in the beginning I assembled my scene with simple boxes, took the camera in the right position and played around with the size of main objects and the distance between them. The challenge here was to bring the objects together without using a tele – objective and losing therefore the 3D effect. When I was satisfied with the result I split up the scene into four areas: the jet in the foreground, the airplane, the first four columns and the background. Then I saved them in different files. I will render the layers separately and put them together in Photoshop afterward. 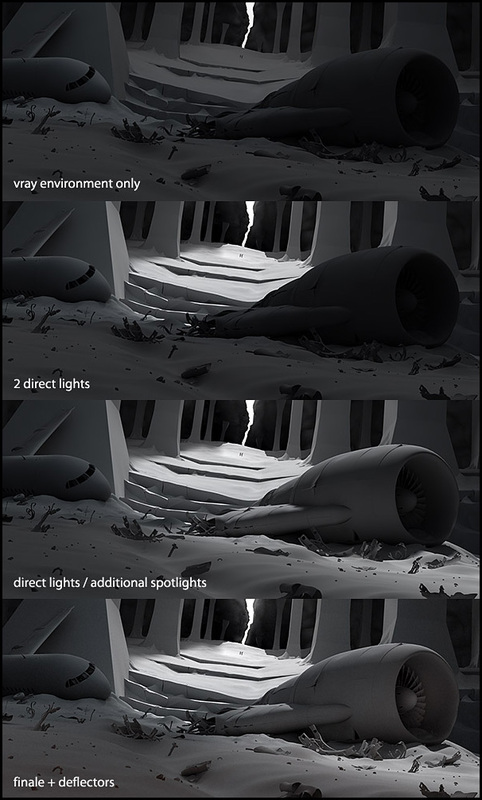 This saves memory, render time and allows me to set up different light settings for each area without affecting other parts in the scene. 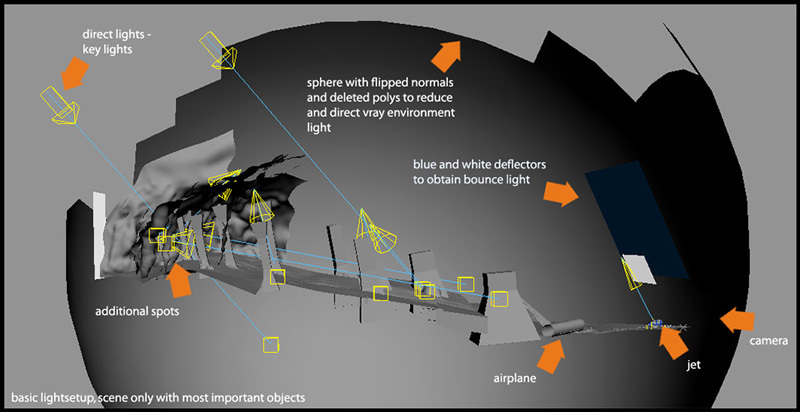 With a lot of research material on my desk, I created the basic shapes of the airplane wreckage and worked out the important details. 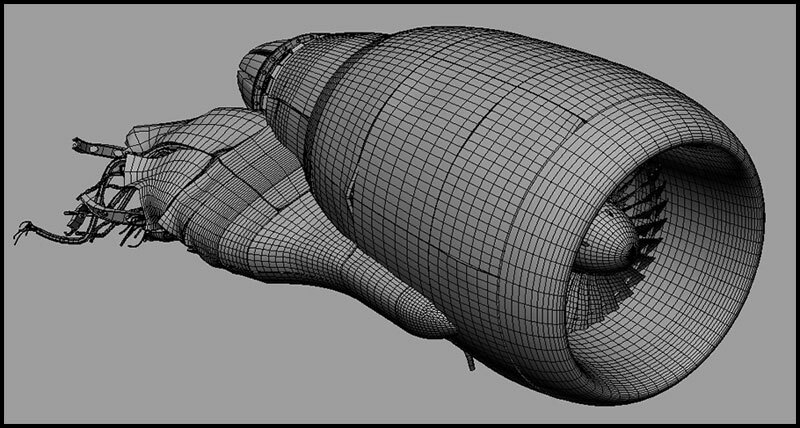 All parts of this image were modeled as editable poly objects with some modifiers on top and never-ending play with polytools like extrude, bevel cut and so on. 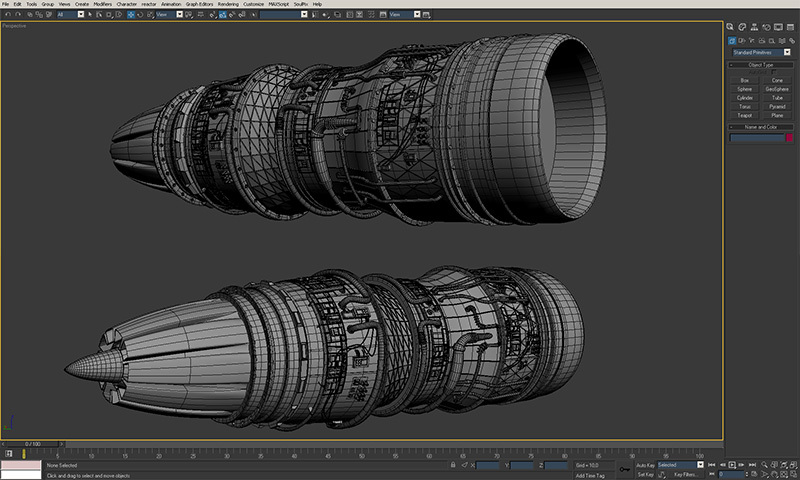 Nothing special, all these functions are well described in 3ds Max user references. Finally I ended up with an almost “lowpoly” scene; only 300, 000 faces (meshsmooth included). Basically I work on lighting before I start to place my textures in the scene. 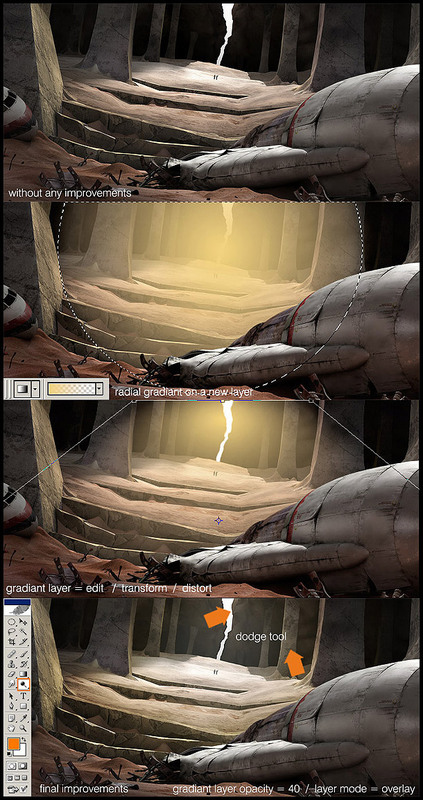 This method gives me more control over the objects behaviour and shows me where later textures need more attention and which parts can be found in dark areas. For the basic light setup I put together the most important objects in one file (as you can remember I split up the scene into four 3ds Max files to accelerate the modeling process). A huge sphere with inverted polygons enclose the whole landscape. 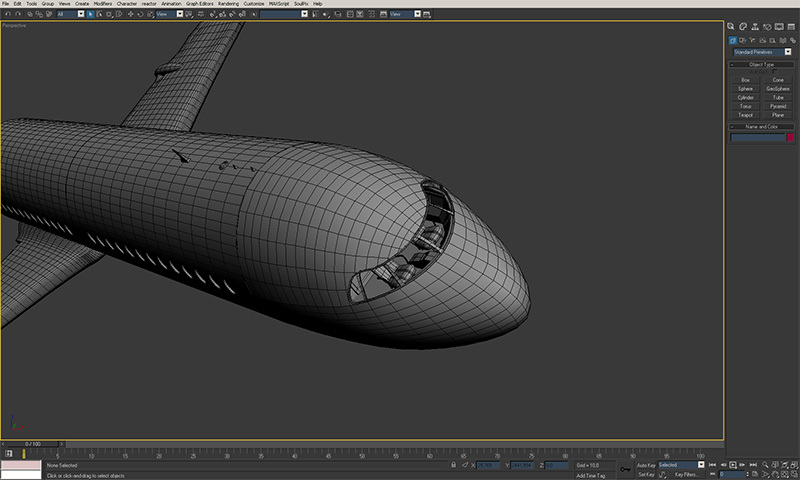 I removed some faces on top of it, so the inside is not totally dark when turning on VRay environment light res. VRay skylight. I ended up with an illuminated corridor between an almost pitch black column hall. Two big backlights, or so called rim or hair lights worked as keylights. A handfull of fill-lights soften the shadows cast by the keylights and add some additional illumination. One last important installation were the “Deflector Lights”. As you can see on the side view image, I put them in front of the hall over the jet. In this case, a deflector light is nothing more than a simple 3D object, a box or a plane with a self illuminated material, to obtain bounced light. If you need a blue tone in your scene, use a blue material or bitmap, if you need red, use a reddish one. I’m sure there exists better methods than that, but with VRay Global Illumination and some fine-tuning, it works very well. 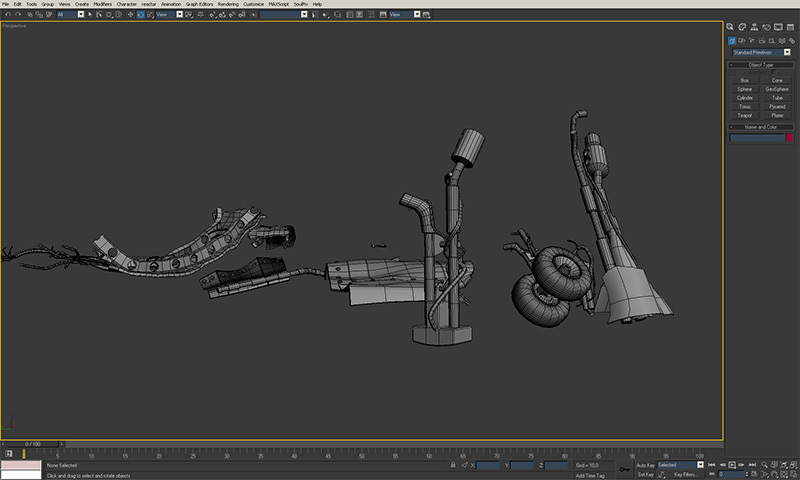 Finally I imported this basic light setup into all four files and started adding additional spots and deflectors. 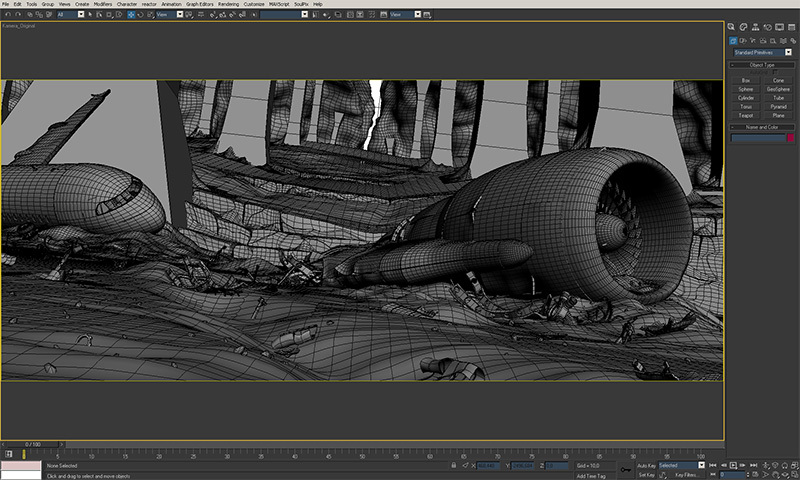 If your computer is too slow to work on complex geometry it’s far better to split the scene up than muddle along on one huge piece. Once I was satisfied with scene illumination it was time to start working on textures – the easiest but most time consuming part if you ask me. I will not go into details here because you can find many good tutorials that explain this process step-by-step. The textures for Arcadia were based on high resolution images from my own collection. I added dirt, scratches and small surfaces details in Photoshop. When I was finished with one, I saved the diffuse map as bump map – same image but inverted, desaturated and with higher contrast. In 3ds Max I put my maps together. I used predominantly Max standard materials, sometimes VRay materials when I tried to achieve subtle reflections. The sand material is a procedural mix map (noise, gradient, falloff and more noise). That’s it, nothing special 🙂 In the end every part of the scene was rendered with VRay 1.09 and saved in a format where I could bind in the alpha channel (TIFF, TGA and so on) I used standard VRay render settings, no VRay lights, no HDRI, only the quick and high quality Global Illumination. 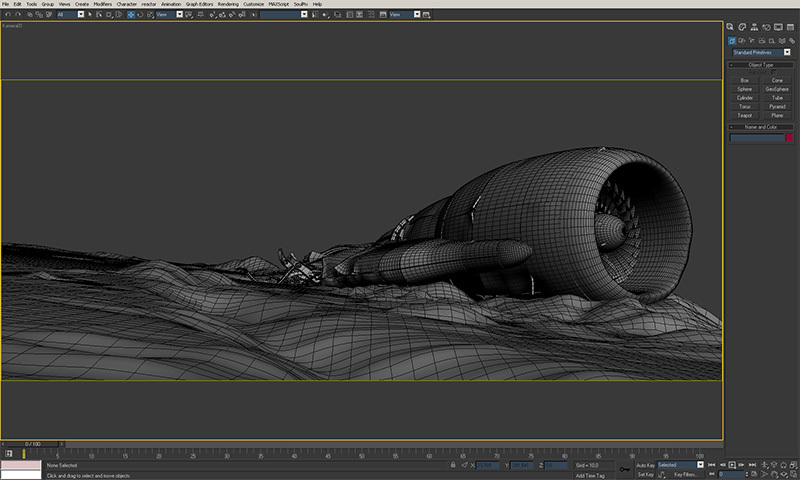 I say always that a pure render out of any 3D software is like an uncut diamond. With some retouches in your favourite painting or compositing program you can enhance the quality of your work enormously. 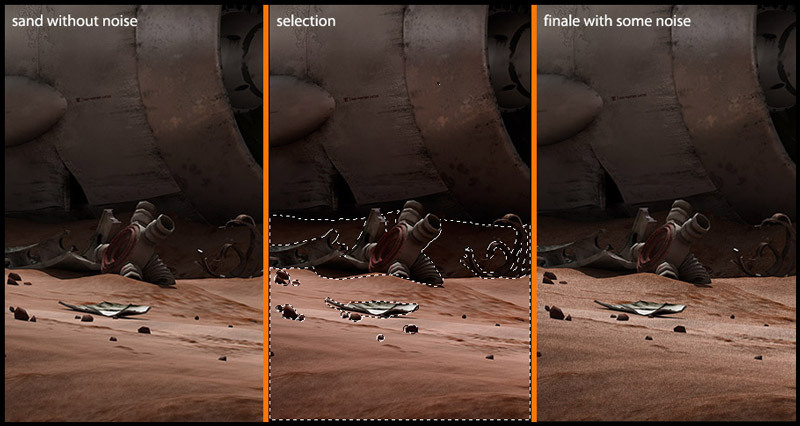 If you know what you can achieve in postproduction, you can early on decide what you have to do during the 3D process. I opened my four renders in Photoshop and, with help of the alpha channels, I put them together in a new file. The several layers gives me the opportunity to work separately on the jet, the airplane and the columned hall. As you can see, without any improvements the whole scene looks terrible; low contrast, watery colours… In fact it’s not even clear from which direction the light is coming. 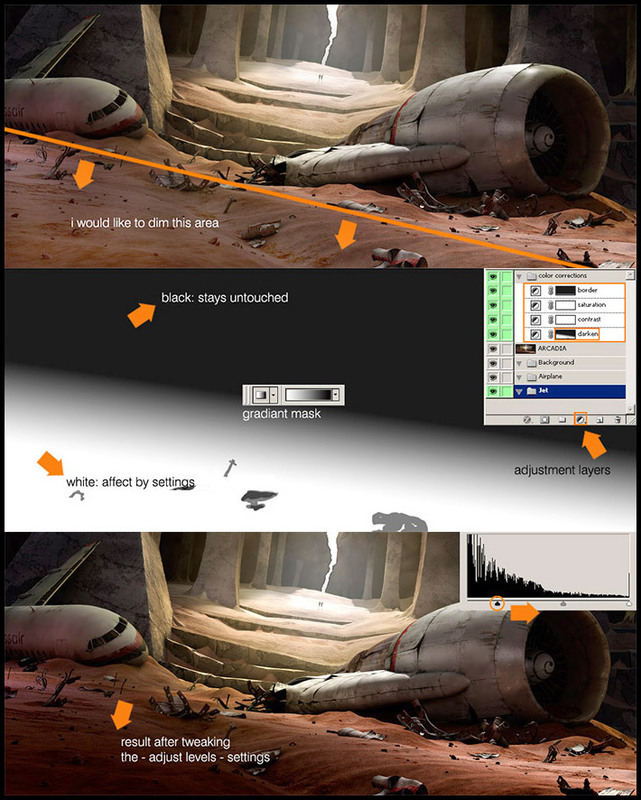 To make the underground more sandy I drew a selection by hand (you can do this with Photoshop selection tools or with the path tool – shortcut key “P”) I copied the selection to a new layer, kept the original sand untouched and added some noise. You can adjust the effect intensity by holding down “Command – Shift – F”- If you use this key combination immediately after applying a Photoshop effect, a small window appears where you can change the effect opacity and the layer blending mode. In a new layer I created a selection on the things I wanted to illuminate. Then I filled the selection with a simple radial gradient (from yellow/gold 100% to yellow transparent). Before I was satisfied with the look, I transformed the whole layer a little bit (edit / transform / distort). This gives the illusion of a bright light that shines directly from the distant background into the column hall. To make the gradient itself less visible I changed the layer blending mode from normal to overlay and set the opacity about 40%. I repeated this process several times with different gradient colours and layer blending modes until I was satisfied with the result. The last thing that I will mention in this tutorial is the brightness correction. As you certainly know you don’t have to permanently apply a level or any adjustments to an image. I always prefer the adjustment layers. They work as normal layers; you can apply, copy, edit and remove them and you can even use the layer mask! I opened up a new – Adjust Levels – layer and put it on the top of my stack. In the beginning you don’t have to adjust anything here, we will come back to the settings later. First I tweaked the layermask to limit the effect. I have done this by clicking on the layermask to activate it (don’t forget to press the ALT button at the same time) Now we need the gradient tool again (first colour white, second black). I drew a gradient from top to bottom. Now the – Adjust Levels – layer affect only the white area whereas the black stay untouched. Then I opened up the – Levels – settings again and played around with the black bar and buttons until the bottom of the image was darker then the rest. I used this technique a few more times to create the desired mood. In the end I put all the layers together and added a slight sharpness effect to the image. That’s it! This entry was posted August 2006. You can follow any comments to this entry through the RSS 2.0 feed. You can leave a comment, or trackback from your own site. sensational! love it to the core! great work and great tutorial ,thank you very much. 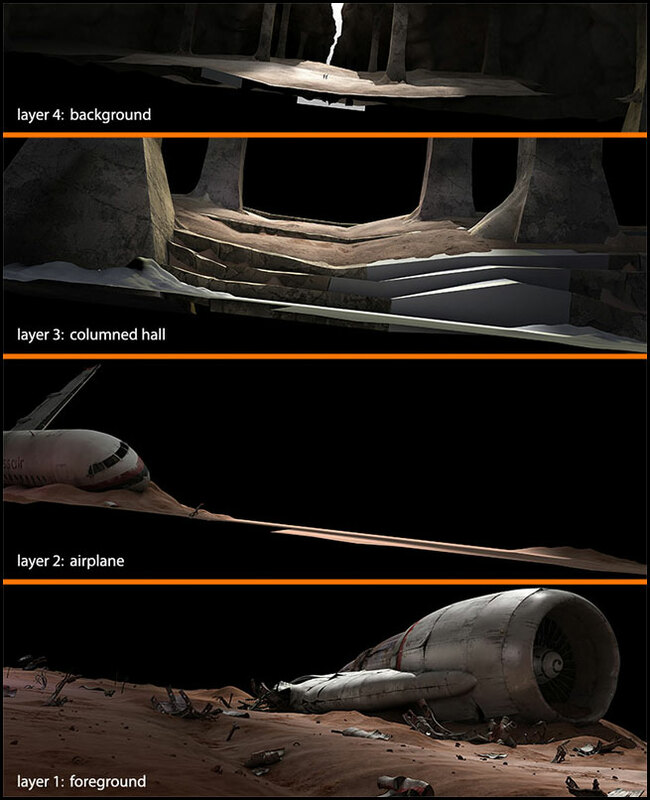 The tutorial is as detailed and intricate as the piece itself. Thanks for showing both. it’s amazing ! how many time to practice with job like this? Selwyn, thats an amazing piece of work and thanks a LOT for giving us a walkthrough of the process as well !! Wow, really brilliant. love the information, thanks man,Great artwork. Hello, works very well!I was a university student from China, I would like to ask about the method of learning artistic anatomy, times Thank you very much! This is cool, thanks for the walk through, also a fan since you use Max! Def going to bookmark your site.